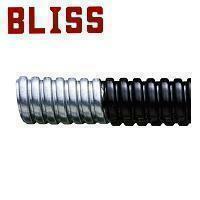 Liquid-tight Flexible Steel Conduit (EU Size)(M2017) - Bliss Yih Enterprise Co., Ltd.
Galvanized steel core with PVC jacket. PVC jacket conforms with UL 360 that is flame retardant, oil and sunlight resistant. Standard color: black. Other colors are also available like blue, orange, white, etc., please contact us for more details.